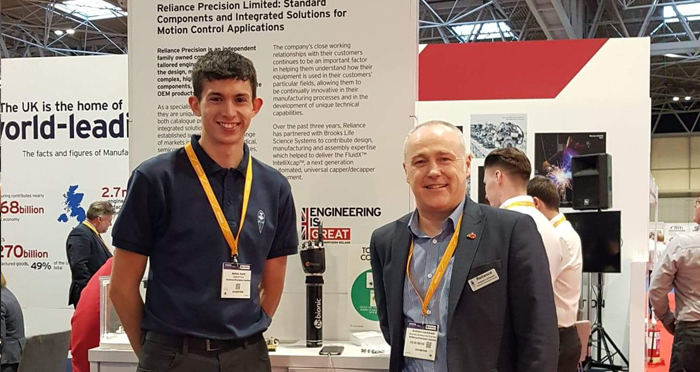 Reliance exhibited their high precision engineering solutions at last week’s Advanced Engineering Show at the NEC, Birmingham. The first time they have exhibited at this event. Celebrating its 10th Anniversary this year, Advanced Engineering is the UK’s largest annual gathering of manufacturing OEMs and supply chain partners wanting to see the latest technologies and solutions. With Showzones this year covering Aero Engineering, Automotive Engineering, Composites Engineering, Connected Manufacturing, Performance Metals Engineering and Nuclear Engineering, the event provided Reliance the unusual opportunity to showcase its full range of precision engineering solutions. Instead of promoting a specific area of the business, Reliance were able to showcase its diverse range of technologies including gears & geared systems, opto-mechanical assemblies, clean & high vacuum assemblies, life science solutions, as well as its standard range of precise motion control components and integrated sub-assemblies. Taking advantage of ERDF (European Regional Development Funding) Export for Growth Funding, Reliance exhibited as part of the Department for International Trade (DIT) UK Pavilion. One of eighteen companies in the Pavilion, they received a fully branded exhibition area to demonstrate their Technologies, as well as the opportunity to attend meetings, seminars and network with new contacts. An XY staging unit showing the high accuracy positioning and repeatability of the Reliance Linear Miniature Actuator. With its low profile footprint, standard units are available in only two weeks, making it ideal for use in prototype design and development. A robotic hand, explaining how Reliance’s actuation technology has helped model the natural movement of the hand in a new generation of prosthetics.